I have found that being a craftsperson in isolation is not as much fun as being a craftsperson mixing with others. The cross-fertilisation of ideas, energy of design and creation is infectious and caution here - contagious. I started the year by reminiscing on the interaction, fun, enjoyment and energy I received and gave from being a member of the Avon Guild. I joined this group in Long Ashton just after buying my first spinning wheel and they guided me through the first awkward stages of knowing a bit about my craft, but not quite knowing where to take it. After deciding to return to college and then work in 1998 I lost touch with both the guild and my craft. Even though I returned to the craft in 2004 and knew that I was "missing" something, I found that with our new commitments it was neigh near impossible to get to Long Ashton on a Saturday. Eventually we overcame this at the start of this year with finding it was easier to get to Devon - 10 minutes up the road from where Toby is staying !! 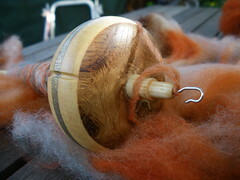 I had already met some delightful spinners/weavers through the Coldharbour Spinners who led me to the Devon Guild. Here I was welcomed and realised exactly what I had been missing from my craft journey. The mixture of doing, learning, sharing and rejoicing in the finished product - in a structured and friendly environment. Ladies (and Gents !!) I have met here led me to join the Somerset Guild which meet the week afterwards - just up the road. So now I get to have two visits a month, plenty of tea, cake and spinning, and be able to spend an extra day each weekend with our son. Sorted !! I was content, until on browsing the Guild Sites I found that there was a talk on Lace Making and discovered the Dorset Guild who meet in Dorchester. This added a third membership to my list and ensured a constant supply of therapy (Herrings being just around the corner !!). Now I am happy - add the Online Guild for all the help and support when I wake up in the wee small hours with creative conundrums and I am complete... 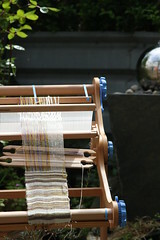 The only question left is where do I find time to spin/weave/dye/knit .....? !! You can follow my continuing adventures at Stranded Yarns where I blog regularly about my crafting journey, and share photos, links, hints and tips that I pick up along the way. Not sure where to start on your Journey? I would recommend the Online Guild - lots of help, support and on-line workshops, plus a subscription to The Journal which contains diary events, news and reviews.